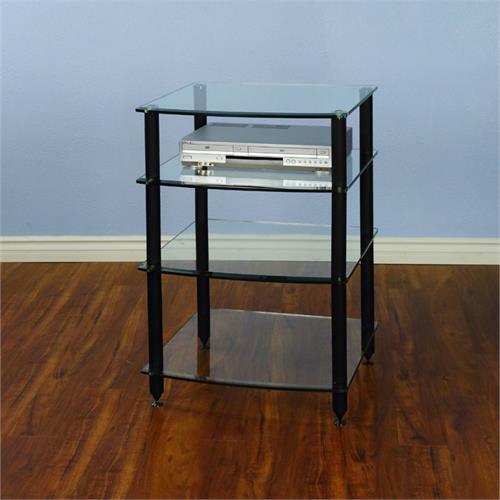 More on the VTI 4 Shelf Audio Rack with Glass Shelves (Black) AGR404B below. Call a VTI AV rack specialist at 1-800-807-1477. Beautifully beveled crystal clear tempered glass shelves. Extra thick glass shelves .4 in. (10mm) for heavy load support up to 220 pounds on each shelf. Pointed foot spikes for best sound performance with foot plates included for different flooring needs. Matching Audio Racks available with five or six shelves (AGR-405, AGR-406).